I think this red puppy is headed for a surprise if he pursues his investigation of that bucket of fence paint. 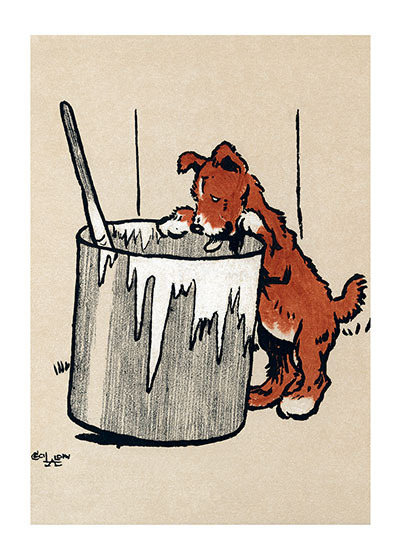 I think this red puppy is headed for a surprise if he pursues his investigation of that bucket of fence paint. I hope it's whitewash getting if off will be a lot easier than paint. From The Red Puppy Book 1910. Cecil Aldin (1870-1935) was a prolific English artist and illustrator. While living in London, he became friends with the Beggarstaff Brothers (William Nicholson and James Pryde), with John Hassall, Phil May and Dudley Hardy, and their influence on his work was great. Aldin, however, developed his own style and was particularly skillful at conveying the humor, love and antics of the dogs and other animal friends. He did a great deal of advertising work, including posters, for such companies as Bovril, Coleman and Cadbury's. Royal Doulton, the china manufacturer, produced about sixty items with Aldin's art between 1910 and 1939. The obituary in The London Times asserted that there never yet has been a painter of dogs fit to hold a candle to him. Cecil Aldin has always been a favorite of ours here at Green Tiger Press, and we have laughed at his wonderful illustrations and reproduced many of them over the years.